This text is from a county emergency manager out in the western part of the Upper Peninsula of Michigan after a severe snow storm … The Mining Journal, Marquette, MI. Up here in the Northern part of Michigan we just recovered from a Historic event — may I even say a “Weather Event” of “Biblical Proportions” — with a historic blizzard of up to 44″ inches of snow and winds to 90 MPH that broke trees in half, knocked down utility poles, stranded hundreds of motorists in lethal snow banks, closed ALL roads, isolated scores of communities and cut power to 10’s of thousands. Myth Blaster Verdict – FALSE. This email has been rewritten and re-circulated since 2005. Snopes posts various versions, the original blaming George W. Bush. 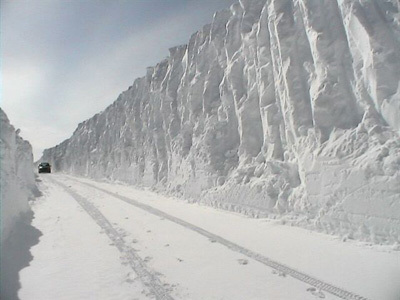 Photo taken in Redfield, South Dakota, accumulation was 12 inches with wind-driven drifts. I tried to find the source of the photos used in the chain email and when they were taken, but, thus far, have not found information on them. Most likely they are from a mountainous region and the accumulation of snow over a winter is depicted – I have seen tall walls of snow on sides of roads like this in Upper Michigan and the Rocky Mountains and places like Japan, Tibet (photo left), and Siberia in Russia. 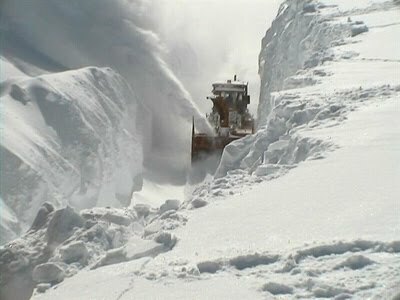 However, the picture makes it look like the walls of snow is all snow accumulation, but it is a road that is cut through an elevated area and when it is covered with snow it looks much deeper. 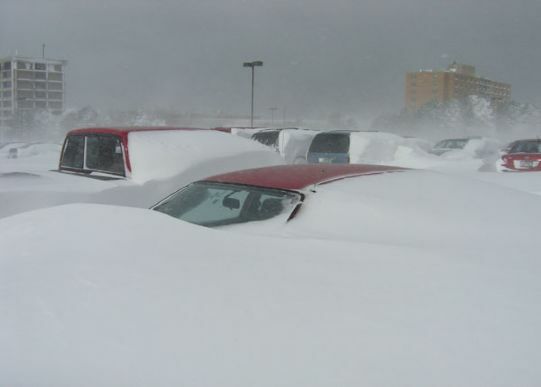 Blizzard reported in Quebec, Canada in December of 2007 occurred, but not 44 inches of snow or 90-mph winds, as email stated. 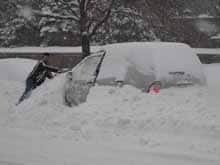 In Montreal, most cars were stuck due to snowplowing streets and snow from the plow blades burying the parked cars as the following picture shows. The Canadian Encyclopedia published an entry concerning Extreme Weather in Canada. No mention of 44 inches of snow with 90 mph winds. The Mining Journal, Marquette coverage posted an article February 19th, 2009 entitled Blizzard, which includes a video and some photos. A little over 9 inches of snow fell in 24 hours with winds gusting up to 33-43 mph. The Mining Journal also reported a two-day storm in the same area on December 10th, 2009 where a blizzard dropped 30 inches on Ironwood over two days and 24.7 inches in Negaunee Township. This may be the storm the originator of this chain email used as the base for their subject. While the winds were strong, it wasn’t even close to the 90 mph winds in the chain email version. The link given in the email doesn’t appear to have anything to do with the subject material. FEMA usually provides help when large amounts of accumulated snow melts in spring and causes disastrous flooding – otherwise state and local authorities, as well as local energy companies handle snowstorms. The rest of the claims in the email are unverified, to include claims that major news sources failed to cover it. They don’t cover falsified reports. All in all, it boggles the mind to think that people still rave about global warming. I would be more concerned with an Ice Age coming, rather than more temperate climates with prolific plant life. Another phenomenon is when cyclic disastrous weather occurs, suddenly it is Armageddon – biblical proportions. This entry was posted in Climate Change, Letters To Editor, Myth Blaster. Saved me the trouble of de-bunking! But note this: In Houghton, Michigan (not Houghton Lake, MI) around the turn of the last century (1800 > 1900) the city and region did suffer a nearly cataclysmic snow storm. It fell & fell until only the tips of telephone poles & rooftop chimneys on 2 story homes were visible. Even for an area whose record low/minimum annual snowfall is 16 feet (often 400" / yr) it was huge. Old photos exist, but the place I last saw them (a few years ago) was in a cyber cafe on Shelden Ave in Houghton. You might find some of them in the personal photo galleries at pasty.com, or the local historical society. DRM:Glad to be of service. I had seen the photos floating around used as a debunking prop against the Global Warming nonsense, but this distortion does not help the cause in revealing misinformation and uncovering information concerning the Climategate scandal.If telephones were in the photos described it narrows it down to the 1900s.Thanks again for your comment and interesting information. How do you know it is Redfield, SD in that one picture? 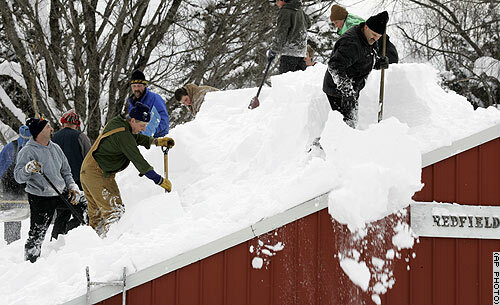 I did a search for Redfield, MI snow and the picture of the guy on the red building showed up. C. Chan: Because there isn’t any place called Redfield in Michigan – but a lot of places and buildings with that name. The photo source, which means the photographer stated it was Redfield, South Dakota. Notice, if I was not sure of location, I stated “unknown” in that particular photo? There must be a long line of Redfield surname descendents in Michigan because I noticed there are streets and buildings with that name, to include an airport in Michigan. Try Google map and/or satellite and see if you can find a Redfield in Michigan? Just what newspaper did you say that photo came from our of Michigan? If so, was it covering the circumstance in South Dakota? Don’t know where you got your information, but photo source, the photographer, should know where he shoots pictures. I presume. All that aside, those states mentioned were all in the mass snow belt that hit at that particular time. And concerning global warming, it has been proven that the last 17 years does not match the global warming junk scientists and their useful idiots/politicians. Personally, I am more worried with an Ice Age that will blanket much of North America – which means starvation, unless there are enough greenhouses to feed the ever-growing population in this part of the world. Thanks for your comment, hope I answered your question.